In conjunction with the exhibition Unveiled: 200 Years of Wedding Fashion from the Victoria & Albert Museum, Dr Gabrielle Fortune will present an illustrated lecture on how wartime austerity impacted on wedding fashion at Te Papa this Sunday at 2pm. Specifically, she will be looking at the wedding dresses of women who married New Zealand servicemen and travelled to the far side of the world to set up home. Between 1942 and 1950, Kiwi servicemen returning from Europe, the Middle East, the Pacific, and Canada brought home thousands of new brides, representing dozens of nationalities. 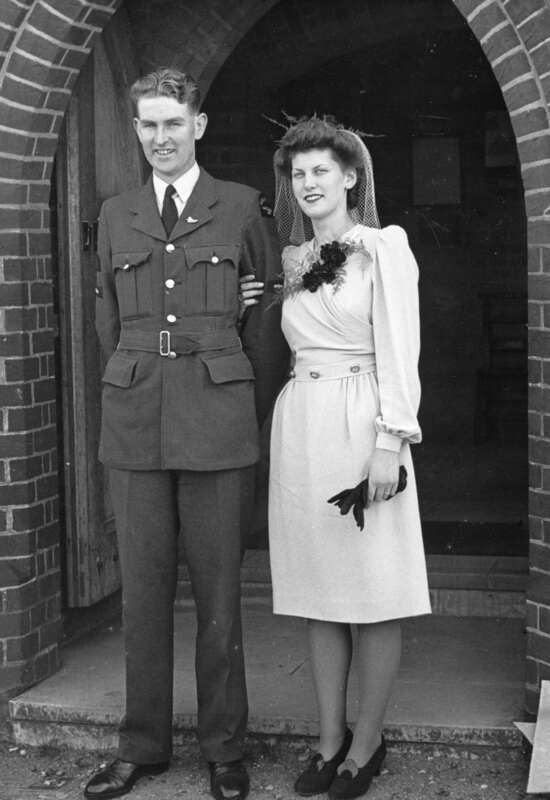 Claire Dunlop and Pilot Officer Allen Dunlop on their wedding day, 16 September 1944. Image courtesy of Claire Dunlop. Although these women from different countries had quite different wartime experiences, most had a story to tell about their wedding dress: how they made the best of available clothing, and how they incorporated national icons or symbols into their dress, cake decorations, or bouquets. Fortune explores an era when clothing coupons dictated fashion – brides had to choose whether to borrow an outfit, wear military uniform, or splurge precious coupons on a dress. Gabrielle Fortune is a Research Fellow in the Department of History at the University of Auckland. Her research interests include the war service of New Zealanders in the 20th century, veterans, and war commemoration. Her PhD thesis examined the history of war brides coming to New Zealand. Lecture: Soundings Theatre, Level 2, Te Papa, 2-3pm Sunday 15 April. Admission free. This entry was posted in Local events, Wellington and tagged Austerity Campaign, Gabrielle Fortune, War Brides, Wedding dress. Bookmark the permalink.